Dreaming of diamonds accents the colors come to life in this "Only Us" ring. Placed in a 14K white gold band, this amethyst ring, measuring 6mm with a total carat weight of 0.13, is an exquisite statement of elegant women's jewelry. Hand crafted especially for you by the experts of Apples of Gold. 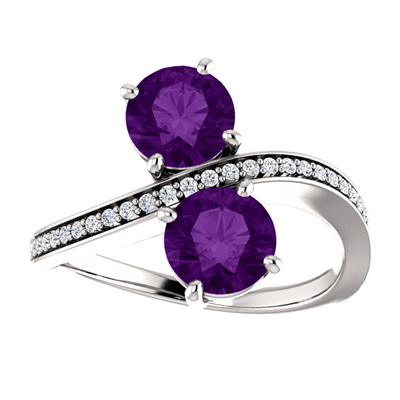 We guarantee our "Only Us" 2 Stone Amethyst Ring with Diamond Accents in 14K White Gold to be high quality, authentic jewelry, as described above.